Her farmers love herand so do rock bands, Nobel laureates and novelists. 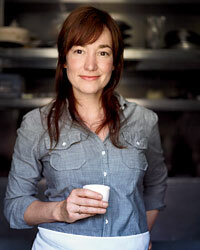 Here, chef Andrea Reusing of North Carolina's Lantern shares her kitchen secrets and recipes. I first learned about chef Andrea Reusing in 2002, back when I was frying catfish at 42nd St. Oyster Bar in Raleigh. "Have you heard about the woman in Chapel Hill smoking chicken over tea?" the line cook, freshly paroled from Central Prison, asked me. I had not. In my 22-year-old innocence, tea was something you drank and chicken was something you fried. News of this rogue chicken smoker and her restaurant, Lantern, spread in a remarkable way. "I was once a guest of the Rockefeller Foundation on Lake Como in Italy," recalls novelist Allan Gurganus, author of Oldest Living Confederate Widow Tells All. "They seated me between two Nobel laureates in science. One rotely asked where I was from. 'Chapel Hill,' I said. His reply put me right at home. 'Oh, yes. Lantern.' "
Reusing and staff. Photo © John Kernick. It seems that everyone who comes to Chapel Hill loves Lantern, from writers like John Grisham to rock bands playing at the Cat's Cradle club. "We go out of our way to eat at Lantern when we're on tour," says Ira Kaplan, the frontman for Yo La Tengo and a friend of Reusing and her musician husband, Mac McCaughan. When I moved back to North Carolina, I was desperate to meet Reusing. I wanted to find out how this woman who'd been to Asia only once (when she followed McCaughan's band, Superchunk, on tour to Japan) had managed to reinvent the perception of Southern cuisine by cooking Japanese, Korean and Chinese food. So I did the only sensible thing I could think of: I went to watch her cook. The first thing to greet me as I entered Lantern's kitchen was a small chicken, tanned a deep brown from an overnight soak in soy and star anise. Reusing was preparing to show me how she makes her legendary tea-smoked chicken. "Unlike a marinade, the brine really penetrates the chicken and seasons it all the way through," she said. "Even if you're not smoking the chicken, this will improve it a ton." She fired up her wok with a steamer basket in the center. A wok occasionally graced the family stovetop during her childhood in New Jersey, when weekends brought excursions to New York City's Chinatown and to the Amish markets near her grandparents' home in Lancaster County, Pennsylvania. It was these influencesAsian flavors, farmers'-market ingredientsthat formed the foundation of Reusing's culinary DNA. From smoke to fire, the chicken was moved to the oven. Most of the world's greatest chefs praise the virtues of trussing chicken, but Reusing took the opposite tack: She freed the leg from the breast with a single slash, which exposed the slow-cooking thigh to more heat in the oven. When the bird emerged beautifully bronzed, meat perfectly moist, I made a mental note to ditch my butcher twine. The success of some of Reusing's best dishes relies on simple tricks. She quick-pickles hunks of honeydew melon with fish sauce, sugar and chiles to pair with quavering cubes of pork belly and adds eggs to her corn soup to give it a velvety texture. Many of these tips will appear in her first cookbook, to be published next year, accompanied by diary-like dispatches recounting meals made for friends and family. She's perfected the art of entertaining on the fly, often raiding the restaurant's fridge to prepare late-night dishes for Arcade Fire and other bands on Merge Records, the label her husband cofounded. Lantern itself is an unlikely indie hit: an unassuming restaurant in a small college town serving Asian-inspired recipes made with Southern ingredients. "What do you call it? I call it American food," said chef David Chang of NYC's Momofuku restaurant empire. "There's always opportunity for chefs across the country to redefine American cuisine. And that's what Andrea is doing." Matt Goulding is the former food editor of Men's Health and the coauthor of the best-selling Eat This, Not That! book series.